Additional info: slides of the Hotsos 2014 presentation "A Latency Picture is Worth a Thousand Storage Metrics". 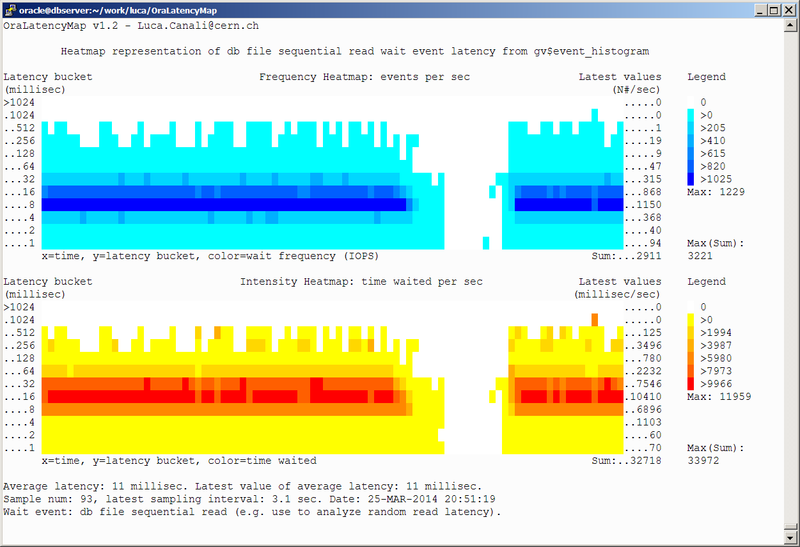 Average latency values are displayed in the graph footer: a global average (across all data in the plot) and the latest value of the average are calculated from v$event_histogram and displayed. More example scripts are packaged together with the tool, including a script for the analysis of 'log file sync' wait event latency and a script for Exadata storage for the latency drill-down of the wait event 'cell single block physical read'. PylatencyMap is the Python version of OraLatencyMap. It provides additional features, mostly related to the integration with multiple input data sources: 10046 trace files, AWR data, DTrace data, replay of measured data. More example scripts are packaged, including a script for Exadata storage for the latency drill-down of the wait event 'cell single block physical read'.